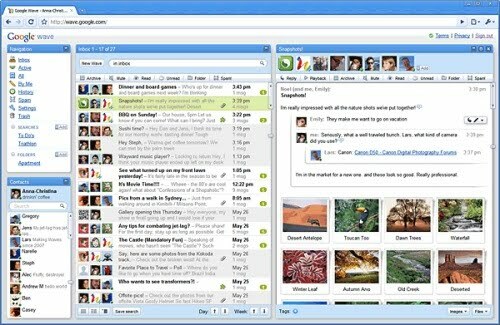 Google Wave was a short lived google product that facilitated the communications between teams. 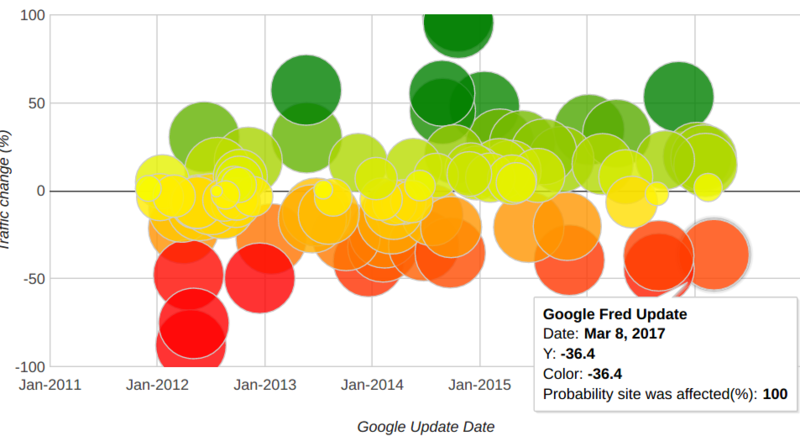 It was first released in 2009, and in 2010, Google already announced that it will be closed. Some pundits say that it was shut down to make space for Google Buzz, who later became Google plus. Maybe it was not wide known and accepted, but most of the users that used it are now regretting it. Today, while searching around WordPress Template directory, I found the P2 template. It is not a copy of Wave, but the way content is arranged made me to think about it. The template has a very light interface where content can be added directly from the home page. It can be used for a better collaboration between teams. It is quick and efficient. It looks a little like reddit, but it is not rating and “up” based, instead, all posts are shown on the homepage like any other blog, so you can see all content not only the “top posts”. 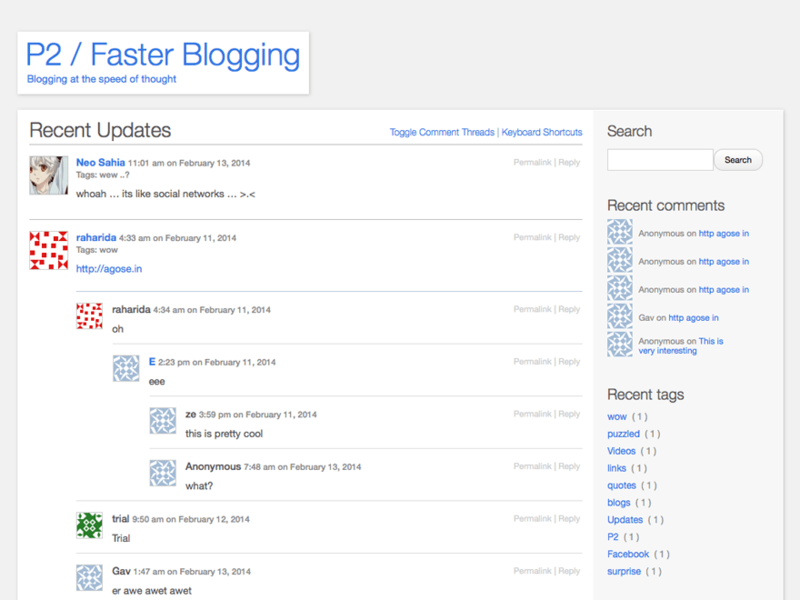 The content with comments is accessible from home page and you have all other blog features like categories, tags, etc. I know that Google Wave had many features that this wordpress template doesn’t, but it might be considered a simplified version. With the right development, it might become a great tool for collaboration. There is a long debate around adblockers and intrusive ads. We all hate intrusive ads that slow down the page load. Some of us hate all ads regardless or their intrusiveness. On the other hand, a lot of website owners rely on ads as main income stream. Both sides are right, but the problem here is that there wasn’t a real alternative to adblockers. Ads are making web experience worse by causing slow page loading, intensive resource usage, risk of potential malware, etc. With an ad blocker you will have a better online experience. You are not tracked by the ad-networks and they don’t get the chance to use your data in other campaigns. You are not followed anymore by repetitive ads. Most websites are powered by the ads that are displayed on pages you visit. If someone likes a page, it will visit it often and will ultimately click on ads. The website owner can continue providing the content or maintaining the tools by making a living from ad revenue. Free content will suffer because of adblockers. Since content providers can’t make money from ads, they will find something else to do or starting to charge for the content. Without any doubt, the real cause of the problem are intrusive ads or over-usage. People got tired of closing the ads that are hiding page content, or continuously clicking on: “take me to the article”. It is very often hard to spot what you are looking for because you are too distracted by ads. We all remember those “you won a million dollars” or “you are the 1 million visitor to this page, click to claim your prize”. Because of this shady techniques, the fair website owners suffer. We can’t be offended by a fair text or image ad from google adsense, but most adblockers block any advertisement. Those who are savvy enough to use adblockers, know that the million visitor is a scam, so those shady websites don’t lose too much because the existence of ad blockers. According to different sources, 10-15% of internet users are using software to block ads. This means a lower income for websites that rely 100% on ads. As a website owner myself, I know that a website that shows ads, will also show some affiliate links and selling ads directly to interested advertisers ( which are not blocked by adblockers because they are looking as normal image links ). Summing it up, the impact is less than 10% on any website. This is not an amount that should discourage someone to provide quality content. Also, ad blocker users usually don’t click on ads. Since adblockers first appeared, website owners were terrified that they might lose all the ad income and ideas arrived. There are techniques or tools that can block visitors using adblocker to view the website. Well, this is not a real solution. Any website owner should know that any visitor is worth, regardless he clicks on ads or not. Any visitor has a potential to tell someone else about the website, share it on social networks, etc. Blocking adblock users is just not worth it. This project is launched for some time, but I think that it is the only real alternative to the display advertising and adblocker problem. All webmasters who are using Google Adsense or DoubleClick for publishers can enroll in the program. They will get money from people who visit their website for every ad that is not displayed. The visitors will pay a small fee $2, $5 or $10. Instead of seeing ads, they can see a blank space or other creative. At first, they will be reticent to paying for content. But sooner or later they will understand that people who write the content, or who create the web tools must be paid too. Google Contributor is still in early stages and it’s not available in all countries, but I hope that it will solve a big problem on web. Today, Automattic announced on their blog that they have released the AdControl plugin. With this plugin, any self-hosted WordPress site can earn income trough wordpress.com ad network: WordAds . WordAds is the Ad Network used on all WordPress.com hosted blogs. Normal users of hosted wordpress can’t opt out WordAds unless they are purchasing VIP or Premium membership. The revenue earned is shared with the blog owners. Normally, WordAds offers ads in a middle rectangle unit ( 300×250 )placed directly below post content. Some sites also show a header leaderboard and a sidebar wide skyscraper. Self-hosted wordpress users can now make money from their blogs and websites too by opting into WordAds network. First, they must apply for an WordAds account and download and install AdControl plugin ( make sure Jetpack is installed ). At this moment, the plugin allows only the middle rectangle ad ( 300×250 ) under the post content. This is a big step ahead for Automattic and WordPress. According to Builtwith.com, there are more than 15 million websites built with WordPress. This is a big opportunity for self-hosted wordpress users to earn more revenue, but also for Advertisers to find new ways to advertise. With this move, there is a new big player in the Ad industry. There are cases when you need to show different content to different users based on their country, or you want to restrict website usage for some areas in which you need to make use of geolocation. There are a lot of tools or apis you can use to accomplish this but you must implement it on your own. To solve this issue, I have created IPGP Geolocation wordpress plugin. The process is simple. 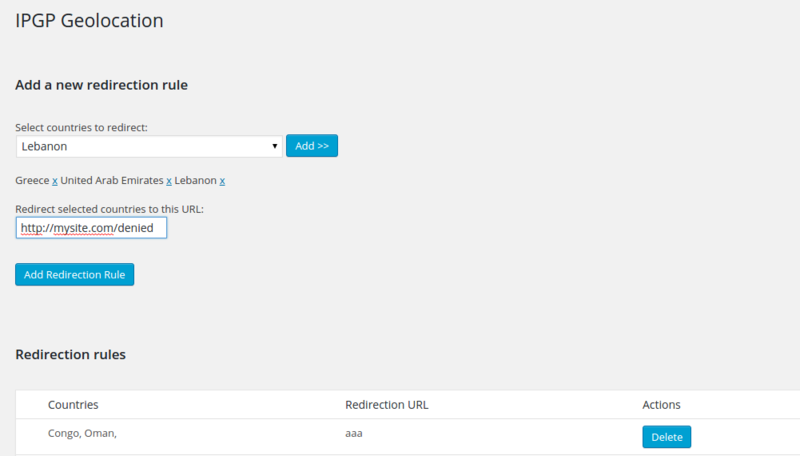 After you install and activate the plugin, you need to select the countries you want to redirect and insert the redirection URL. All traffic coming from those countries will be redirected to that URL. If you have any problems, suggestions or you only want to give some feedback please use our support page.